Getting the best post-hospital care is important to you and to your family! Often, people go through great effort to choose their primary care physician or hospital carefully, but neglect to put the same effort into selecting the best healthcare providers to help them through their recovery. Don’t fall into this trap. Learn about your options and choose wisely. Selecting an ARMS-affiliated location can significantly reduce your risk of re-hospitalization. ARMS can offer the highest level of care outside of a hospital setting. The ARMS care model is an industry-changing approach to quality, rehab length of stay reduction and unprecedented decline in hospital readmissions. Because of the breakthroughs ARMS has achieved, its founding physicians, Dr. Jeremy Kirk and Dr. Adam Andres, were recognized as finalists in the Indianapolis Business Journal’s 15th Annual Healthcare Heroes Awards! With hospitals discharging patients sooner-and-sooner, many people need a lot of health care services for days or weeks after leaving the hospital. Medicare and other insurance payers require hospitals to provide patients with information about all of the nursing homes and home health providers in your geographic area. With so many options, it can be overwhelming, particularly when dealing with an unexpected hospitalization. Under traditional Medicare, you can choose from any location or agency that you wish. With Medicare Advantage, and with private insurance plans, you still have the right to choose but coverage will be best within your network. If receiving care with an ARMS-affiliated rehab, nursing facility, home health, hospice or assisted living is important to you, be sure to ask your hospital discharge planner, case manager or social worker which nearby facilities partner with ARMS. 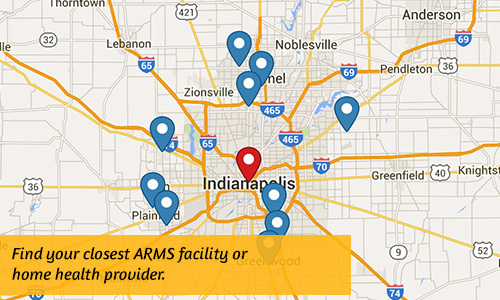 Or, find your closest ARMS facility or home health provider. Knowledge is power and there are a variety of online resources to help you make informed decisions about your healthcare and rehabilitation options. Is the facility convenient for friends and family? Are the caregivers compassionate and knowledgeable? Is the facility well maintained? And, most importantly, does the facility make high-quality care a priority? If receiving high-quality care is important to you and your family, look for post-hospital care that is affiliated with ARMS.